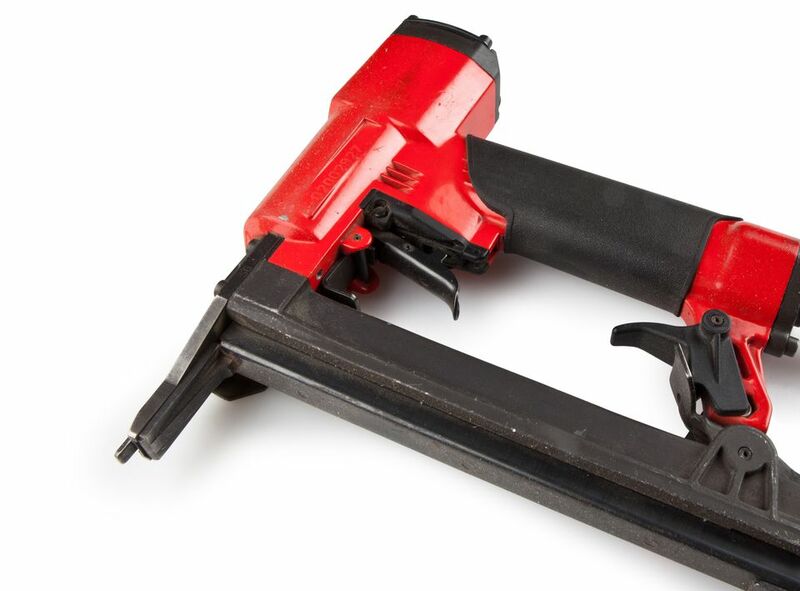 If you are a veteran of the manual method of hammering up trim, you may be thrilled to learn that there is a better way to secure trim: with an electric nailer. It is easier to use than nailers that required compressed air systems and air hoses. A brad nailer is an electrically powered tool that fires 18 gauge brads (no staples). Either cordless or corded, this tool loads an air compression chamber by means of an electric charge. The power that shoots the brad comes from the chamber discharging. Brads are 18 gauge and can be as long as 2". These tools cost $50 to $120, with corded models being cheaper. It's not for tacking up insulation, plastic sheeting, or thin material like veneer. For that, use a stapler/brad gun. These fire two-pronged staples, which are necessary for ultra-thin materials to prevent them from tearing through. Also, they fire single-prong brads up to 1/2", more or less. It's not for construction work such as framing a house or nailing a 2x4. For this, you need a pneumatic framing nailer with either a stick or coil magazine capable of firing 1 1/2" to 3 1/2" nails. Air Pressure Dial: Adjusts the amount of air that is expelled when you press the trigger. More air pressure means deeper brads; less pressure means higher brads. Depth Gauge: Adjusts the distance of the nailer from your work material. Magazine: Brad strips are loaded into this section. Magazine Lock: Press this to load the gun. Don't confuse this with another lock at the other end of the magazine which is used only to clear the magazine of jammed brads. Ensure that your brads are within the correct range of length. The tool shown here takes brads between 5/8" and 2". Of course, anything greater than 2" simply will not fit. But what about brads shorter than the lower end of the range? While they may fit in the magazine, they will not fire properly. They will likely jam at the end of the magazine. Gauge, or the thickness of the brads, is vitally important. What's the difference between 16- and 18-gauge brads? A lot. In fact, an entire tool's difference. When you get up to 16-gauge brads (lower gauge numbers indicate thicker brads), you may need a completely different nailer to use them. Handle the brad strip carefully so that it does not break apart. No, it's not absolutely vital that the strip remains continuous; you can piece together shorter lengths, as shown here, just like you would with an office stapler. But you can ensure smoother brad feeding operations if the strip remains unbroken. Typically, you will slide the brad strip as far forward (in the direction of the nailer's firing end). It's tempting to vigorously slap the magazine shut. And, yes, you will need to slide it up with some amount of force to make it lock into place. But too much force may cause the brad strip to fall out of place (especially with non-continuous strips) and jam the nailer. First, find the workpiece contact point on the "muzzle" end of your nailer. This contact point depresses when you push the nailer against your workpiece. For safety reasons, the gun cannot fire if the contact point is not depressed. Keep in mind that the brad fires slightly apart from the contact point. In the accompanying image, notice that the brad fires about 1/4" higher than the contact point-missing the trim entirely. Protruding: Worst. This is doubly bad because if you try to hammer the brad the rest of the way in, you'll bend the brad over. Remember, this is a thin wire, not a finish nail. Not only that, you'll ding your workpiece. Avoid at all costs. Sunk: Better. Brads sunk far below the surface won't sufficiently hold the material in place, especially if the material is a mushy substance like MDF. If the head is sunk below the surface, yet you can still see the shiny head, it's fine. Level: Best. Brad heads are smooth and small. If you place the head at level with the work surface, the head will be invisible after painting. You did intend to paint, didn't you? Also, the brad heads will hold the material firmly in place. If the material is wood and you wish to keep a natural finish, your only option is to sink it and apply wood filler. Two features control depth: air pressure dial and depth gauge. It can be tricky balancing the two features since they sometimes work counter to each other. Gather scrap materials that are the same as your intended workpiece. This is important because materials have different thickness and density, which affects the depth of the brad. Begin with the air pressure gauge. Adjust it to a middle point between high and low. Next, adjust the depth gauge to a middle point. Test fire a brad. If the brad protrudes, adjust air pressure to a higher level. If sunk too far, ease up on the air pressure. Use your air pressure as your primary means of adjusting depth. Once you are in the general range, you can use the depth gauge to fine-tune the depth.